Here are a few fun vintage (and vintage-inspired) items that I've discovered online and wanted to share with you. 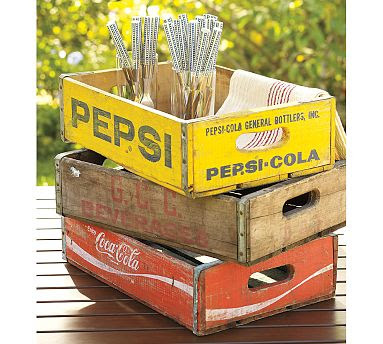 These Found Soda Crates will be available at Pottery Barn at the end of this month. Each one is unique, as they are real wooden vintage soda crates. Previously owned stuff for sale at Pottery Barn?! Who knew?! At $15 each, these would make a fun addition to a screened porch (fill with small potted plants), a child's art space (imagine this full of jars to hold crayons, chalk, or paint brushes), or a teen room (use to corral school papers or as a holder for the ubiquitous teen mags). 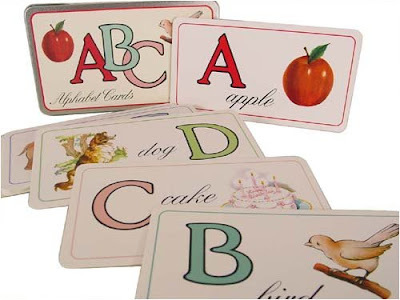 These Vintage Look Alphabet Flashcards from Paper Luxuries would make delightful wall art in a child's room or nursery. To see a similar set of cards in action, take a look at this sweet nursery. 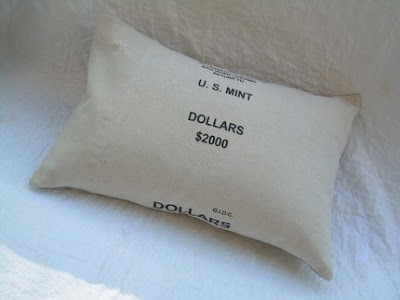 This Money Bag Pillow ($29) made by Etsy seller Leslie Janson is made from an actual vintage U.S. Mint bag that held $2,ooo! This just makes me smile. For some reason, I imagine a burglar laughing maniacally as he dashes away from a house clutching this little Etsy pillow to his chest. 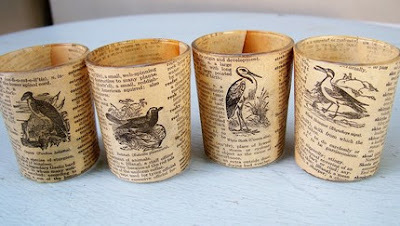 These darling tea light holders from Etsy seller Carolina Cottage are made using decoupaged images from an old dictionary. 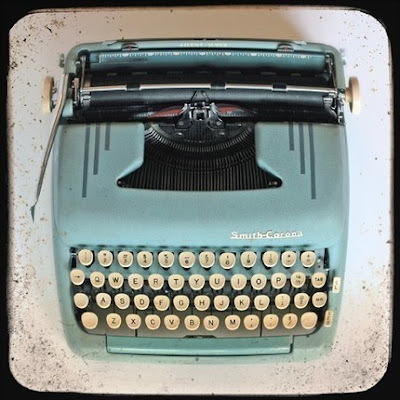 Frame this 5x5 Fine Art Photograph of a 1950's typewriter and you'll have a fun piece of artwork for your home office--or a unique gift for your favorite writer. Photo is $12 from Etsy seller FriendlyMade.